Try to avoid being an orphan. Apart from the fact of not growing up with a Mum and Dad, a good knowledge of your parents’ health profile is important from your future health’s point of view. We are discovering every day that heredity plays a very important part of your health profile. We all have much to thank our parents for. Just letting us grow up for starters. If my young son continues much longer with the three year old tantrums, he’s going to be lucky to reach his fourth birthday. If either of your parents had diabetes, your elder brother has diabetes, your younger brother has diabetes and your cousin has diabetes, what are the odds on your getting (or already having) diabetes? Again this does not need Einstein. The answer is pretty damn high! And yet, I see families like this, where the individual members are totally surprised and amazed when they fall ill, go to hospital, and diabetes is diagnosed. ‘Tis the merry month of May when the birds begin to play and Uncle Biffo is popping over for a visit! Biffo the Bare, as he is known at home, is a keen naturist and wonders if there is anywhere locally to get his kit off? Of course there are places for your uncle to get his kit off. The shower and the bedroom spring immediately to mind. I would have thought you could have worked that out for yourself. Before you ask, I am not volunteering to assist him (or you) in any way. My girlfriend speaks quite good English, but I can find it difficult to understand what she is trying to say some days and we end up having an argument. The other day she seemed worried and when I asked her what was wrong, she wouldn’t tell me but said, “I want stay by myself” so I thought she was tired of our relationship and wanted to leave. I asked her why, as everything seemed to be OK the day before, but she just started to get mad at me for continuing to ask her what was wrong. The next day, when she hadn’t left I worked out that what she wanted to say was she was trying to work out a personal problem, so she wanted to be “alone” for a while to work it out. If I had known that was what she wanted I wouldn’t have pressed the point. I try to understand, but it is a problem. Have you any advice for this communication problem we are having? Be bewildered no further, my Petal. I have the answer for you. In any relationship, clear and open communication is most important. When the two people come from different cultures and have different native languages, then it becomes even more likely that confusion will occur. Your girlfriend is trying her best to communicate with you in a foreign language, but I note you do not say whether you can communicate with her in Thai, her language. If there are times of confusion, you should just say “Kaw tort, mai kow jai” (sorry, I don’t understand) and ask her to put it another way. Finally, try not to hang on the literal meaning of every word - try and get the overall meaning or emotion. And get some Thai lessons too! How much salary should you give a girlfriend? My girlfriend did work in a bar before she met me and comes from Isarn. My mate says about 30,000 baht should be enough, but I am getting grumbles from ‘her indoors’ that I don’t pay her enough at that sort of money. My argument is that she doesn’t have to buy household items with that 30,000, it is clear profit for her. I pay for the housekeeping and the maid. I bought her a motorcycle and pay for the petrol. What is your suggestion on the right amount of money to pay a girlfriend? Would I surprise you if I suggested that the answer to the “right amount of money to pay a girlfriend” is “Nothing!” You use words like “pay” and “salary”, but why? Is this a regular job? Advertised in the Classified section of this newspaper, “Wanted, live in girlfriend. Good living conditions. Free motorcycle. Salary 30,000 baht to the correct applicant.” If so, that comes under the heading of a “mia chow” (rented wife), and could perhaps be looked upon as “employment”. That being the case, what should the “salary” be? If the woman works in an office she will get around 10,000-15,000 baht as a university graduate, and will have to pay for her own room rental and food. So why should a non-graduate get twice as much, plus live-in perks? I am supposing here that your ‘her indoors’ probably left school after Mattayom 3. (Feel free to correct me if your girlfriend is a qualified brain surgeon.) I suggest that you are much better off living on your own and paying for company as and when needed, rather than having a resident demanding overpaid “employee”. Why do the people here totally ignore zebra crossings? There is one outside of my office and I swear they speed up as they approach it, not even slowing down at all. Pedestrians take their life in their hands when crossing the street, and I very often see tourists almost get skittled because they don’t know the ‘rules of the road’ here. What is the reason, Hillary and what is the answer? Such a nice name is Zeke, and I think you must be an American, one of the countries where zebra crossings are followed. I can understand your concerns, at my age I have to take a motorcycle taxi to cross the street as it takes too much time to try walking across. After many minutes of in depth research I have found the answer for you. It is part of a tourism promotion called “Rushin’ roulette” to give the visitors a little more excitement than just sightseeing and riding on elephants and such. It has worked very well and brings in much wanted revenue for the hospital system. Having made the break from film to digital with the Lumix DMC FZ50 bridge super-zoom camera, I thought that as a warning to first time purchasers I should retell the story of our first foray into digital compacts, of which there are scores to choose from, believe me. Buying any type of camera in this country is an exercise worse than buying a new set of spectacles. Anyone who has been dragged into an optometrist’s by a bevy of immaculately dressed young ladies, and then pounced upon by a white coated technician who wants to give you a computerized eye test, while the aforementioned bevy is weighing up your wallet, will know what I mean. We ventured into one of the large shopping centers and began the window shop overview, to be attacked by a bevy of young hopefuls, obviously on their day off from the eye glasses department. In no time at all, we were shepherded inside the shop and the sales pitch began in earnest. Features were thrown at us like confetti at a western wedding. The mountain of carefully unwrapped cameras also began to grow like Mt. Everest. Despite my wife now in a state of total confusion she saved the day by telling the eager sales people that we were going to walk around and discuss it. Unfortunately, the next camera shop was right next door, and having seen that their neighbor had failed to clinch a sale, pounced with an even greater intensity. Once again we were shown a myriad of cameras, all of which seemed to do the same job when we thought about it! We were starting to become informed customers, a dangerous breed of animal! 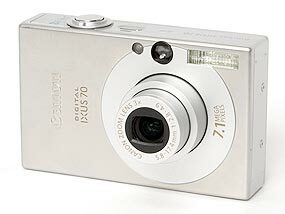 One feature that my wife liked in these point and shoot digital cameras was the ability to take short video clips. Now being smarter than we were before we asked if these video clips could be played back on the family TV set. When we were told yes, we then asked to see this demonstrated. If you also think this would be a great feature, then think again. In the more budget end of the digital point and shooters, the video end result is poor to mediocre (at best). The images look like the pixilated photographs on the front page of Thai newspapers, thinly disguising dead bodies at traffic accident scenes. The more we investigated, the more it became obvious that digital point and shoot cameras are really only still image instruments. You are not going to get ‘movie’ quality and still capabilities at this level. Like the microwave oven that has a clock, you will never be able to use it as a wrist watch! It is an oven that can tell the time, not a clock that cooks food! And so we went on to another shopping center, to more eager sales personnel, but by this stage we knew what we wanted. And, we knew what we wanted to pay! Before you begin the search, make sure you have the budget figure firmly in your head. The sales team are there to try and get you to spend as much as possible, remember. We needed a camera with good optical qualities and a good sized memory card. An optical zoom makes sense at this level - much more important than digital zoom, but a most important feature is the viewing screen, known as an LCD monitor in digital terminology. Get the biggest you can. There is an enormous difference between looking at a two inch screen, compared to a one and a half inch screen, believe me. Another factor that we considered important was physical size. Size does matter! But this time we were looking for small dimensions. Since digital technology allows miniaturization, this means a woman can pop the camera easily in her handbag, or a man into his shirt pocket. So that was how we made our choice of digital point and shoot compact. Small overall size, large viewing screen (oops, LCD monitor), easily operated controls and from a known quality manufacturer. Over a year a go, even though everyone knew that the majority of Western economies were up to their necks in debt, nobody thought they would be in a similar situation to Japan. Also, no-one believed we could possibly have anything to learn from what Japan has done over the last ten to fifteen years. Now, the shoe is on the other foot and we have to ask if they will do as well as Japan in coping with the economic pooh they now find themselves in. One critic has described this as balance-sheet deflation. Without doubt, one of the best analysts of what happened to Japan is Richard Koo of Nomura Research Institute. He is also a big believer in the fact that balance sheets actually do matter. Those that have borrowed too much could well be threatened with bankruptcy and have problems with reducing their debts. A dramatic fall in asset prices which have been bought via debt will have a much bigger impact on an economy than the same fall if those assets have been purchased through little or no debt. As a quick reminder with what happened to Japan in the Nineties, it must be remembered that many of the problems with regards to private borrowing and spending was not down to the banks but due to the borrowers. What this did was create a position in which, as JM Keynes said when referring to America, low interest rates were “pushing on a string”. Japan’s rates were ridiculously low for years. This meant that those who were in debt could pay down their loans. So, what can the West actually learn from this? Amazingly, the answer is ‘lots’. What this means is that there is a massive difference between a recession which has been caused by the central bank wanting to defeat inflation and one created by massive debt and falling net worth. With regards to the former, the central bank actually helped cause the recession, with the latter it has tried to stop it. Recessions related to credit problems have always been more protracted and more severe and thus are more likely to lead to a depression. Even though Japan suffered a loss of three times GDP and a contraction of 20% of GDP in the financial balance of the corporate sector, from losses into surplus, Japan never had to go through a depression. This is amazing given what they had to play with. The reason it happened were the large fiscal deficits. Just think, in 1997, the government tried to bring down these deficits and the economy nearly went into freefall and what they tried to reduce actually ended up increasing. It is vital that if there are losses then they need to be acknowledged. Recapitalising the financial system is also important. The Japanese had to cope with weak banks for over ten years. This was because there was a public enmity to bankers which meant it was very hard for the government to put money into the economy via these financial institutions. These banks also refused to allow any companies in trouble to be nationalised. This caused many political problems. The matter was forced in 1997 when the reality of the situation had to be confronted. This was also the situation in America six months ago but the chance to recapitalise and restructure were missed by the then incumbent administration. Slumdog Millionaire: US/UK, Crime/ Drama/ Romance – You really owe it to yourself to see this movie in a regular cinema, with a nice big screen and a good and powerful sound system – like Vista. It’s the only place to fully appreciate the fantastic images, sounds, and music of this spectacular film. And seeing it another time will allow you to appreciate more fully the photography, the scripting, and the score. To be sure, some horrible things happen to the characters in the film, but most people think that’s made up for by the various skills of those who fashioned this excellent film. It’s a breathless, exciting, heartbreaking, exhilarating story about a Mumbai orphan who rises from rags to riches on the strength of his lively intelligence. This gem of a film won Oscars for best: picture, director, adapted screenplay, original score, film editing, original song, sound mixing, and cinematography. Rated R in the US for some violence, disturbing images, and language. Reviews: Universal acclaim. For sure, a must-see film! At Vista only, and many thanks to them for bringing it to Chiang Mai. Night at the Museum 2: Escape From the Smithsonian: USA/ Canada, Action/ Comedy – After a wacky night at the Museum of Natural History, the perpetually hapless Larry (Ben Stiller) must infiltrate the Smithsonian after shipping two of his resurrected friends to Washington by mistake. As a result, he finds himself in the middle of a vast conflict between many of the museum’s most noteworthy historical figures. Robin Williams, Owen Wilson, and Steve Coogan are back, and this time they’re joined by Amy Adams, Jonah Hill, and Christopher Guest. The central thrust of the film will be bringing to life the Smithsonian Institution, which houses the world’s largest museum complex with more than 136 million items in its collections, ranging from the plane Amelia Earhart flew on her nonstop solo flight across the Atlantic and Al Capone’s rap sheet and mug shot to Dorothy’s ruby red slippers and Archie Bunker’s lounge chair. This is the first major film to be shot inside the Smithsonian in Washington, and the building may never be the same. Mixed or average reviews. Krasue vs. Pop / Kra Seu Fad Pop: Thai, Horror/ Comedy – A fight between two of Thailand’s most feared female ghosts, both played by pretty young actresses. Krasue is a flying vampiric head that trails its entrails around. Pop is a demonic spirit that likes to eat people’s livers. Shown in Thai only with no English subtitles. Angels & Demons: US, Crime/ Drama/ Mystery/ Thriller – It’s a lot of fun. The team behind the global phenomenon The Da Vinci Code returns for this tight and taut follow-up, based on the bestselling novel by Dan Brown. Tom Hanks reprises his role as Harvard symbologist Robert Langdon, who once again finds that forces with ancient roots are willing to stop at nothing, even murder, to advance their goals. Ron Howard again directs. Good news for Catholics: unlike the first one, the Church has not forbidden you from seeing this one. Mixed or average reviews. Saranae Howpeng: Thai, Comedy – Movie version of “Saranae Show” – a popular Thai comedy TV show that has been on the air for 11 years. Stars many well-known Thai comedians. Terminator Salvation: The Future Begins: US/ Germany/ UK, Action/ Sci-Fi – With Christian Bale, Moon Bloodgood, and Common; directed by McG. In this highly anticipated – in some quarters – new installment of The Terminator film franchise, set in post-apocalyptic 2018, Christian Bale stars as a man fated to lead the human resistance against Skynet and its army of Terminators. But the future he was raised to believe in is altered in part by the appearance of a stranger whose last memory is of being on death row. 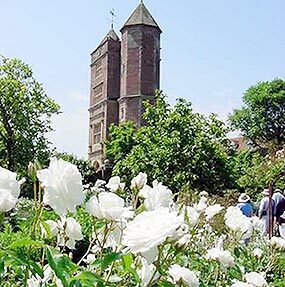 Just like Knowle, where Victoria Sackville-West was born, Sissinghurst has a long entrance block with a central gateway through which one passes to enter an enclosed courtyard in which guests are greeted before being allowed to enter the castle itself. The entrance to the castle is through an impressive gateway flanked by two tall towers and situated opposite the first gateway. The two towers of Sissinghurst Castle where Victoria Sackville-West made her home. Unlike Knowle, the rest of the original castle and moat had long since disappeared, replaced by an orchard of apple trees under-planted with daffodils. Even so, Vita immediately fell in love with the modest courtyard, as it reminded her of the beloved home of her youth. As soon as she moved in, she claimed the two red-brick towers for her own - her private study areas where she wrote her poetry and her famous family diaries. By climbing to the top of the towers, she could easily survey progress in the surrounding gardens and in the farmland she owned around the castle. After her undisturbed, private writing had been finished for the day, she could cross the courtyard with her two black Labradors and go to her library/living room to entertain guests or read the classics. In those days, good people of value were expected to complete their studies when ‘coming of age’ by travelling to Italy and Greece on a ‘Grand Tour’. Ladies were always carefully chaperoned by a vigilant aunt or other worthy relative against the amorous intents of the native population living in these ‘cradles of civilisation’. Italy, of course, was the birthplace of the Renaissance period, bringing it out of the dark ages with the flowering of new scientific thought, and the consequent discoveries. Wealthy merchant patrons contributed extensively to the extraordinary flowering of great art at that time. The influence of her travels explains why Vita first attempted to create a ‘Mediterranean’ garden, full of rocks and broken stone relics, reminding her of the ancient ruins in Greece and Turkey where she spent her first blissful married years. Adjacent to this garden, she planted an avenue of white almond trees which doubtless reminded her of the islands of the Mediterranean, whose terraces in February are covered in the same blossoms. However, this first garden, she often admitted, was never a success in cold, wet Kent! The ‘almond avenue’, no longer in existence, sowed the seed of inspiration for her most famous achievement, the ‘White Garden’. A view of the ‘White Garden’. Placed on the south side of one of the only two remaining original 18th century buildings on the left of the old castle site, one of which Vita used as her bedroom, the ‘White Garden’, using only white flowers, became, over the years, her most successful achievement. In one sheltered corner, she used relics of ancient Greek pillars to create a pergola as a seating and dining area in the Mediterranean style, shaded with vines. A large pot used for storing olive oil was placed in the centre; after the almond trees had been removed, it was covered over and shaded by a metal gazebo supporting a vigorous white rambling rose. The rest of the plants were enclosed within an intricate chequerboard pattern of box hedging and paths, each section containing an enchanting combination of rare plants. 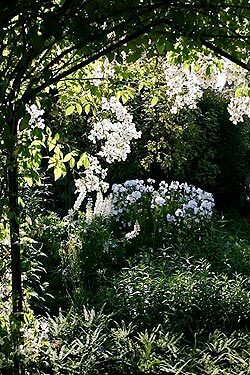 Half of the small garden contains a seat, flanked with by wonderful herbaceous borders, ending with a statue beloved by Vita placed underneath a silver-leaved pear tree. This lovely setting is sheltered from the bitter easterly winter winds, for which the county of Kent is infamous, by three sides of the red-brick Tudor courtyard wall and a yew hedge. Vita’s husband, Harold Nicholson, was responsible for the yew hedge, planted in a formal and masterful design, respecting the original layout of the castle which was being revealed at that time by excavation of the footings. Again, the planting of the hedge was inspired by formal Italian gardens seen on the Grand Tour; like many eminent Englishmen at that time, he copied the fashionable Italianate style of layout in hedging, paths, steps and statuary. This style had developed naturally from the steep Italian sloping terraces, often looking out to sea or to mountains, needing sturdy shelter from the Sirocco winds and searing heat and involving level terracing and many steps. At Sissinghurst, of course, the land was flat, and the heat of an English summer is not strong. As a result, unlike Italian gardens in which only a few sturdy varieties of flowering plants can be grown (with pots of Azaleas in spring and Agapanthus in summer being used), in an English garden a huge range of exotic flowers, sheltered by hedges, nurtured by the abundant rain, and cosseted by mild temperatures, can be planted. Vita and Harold were both members of the Royal Horticultural Society, paying a regular monthly visit to the Horticultural Halls in Vincent Square, Victoria, to inspect the nurseries. They would select and order the rarest plants, collected by enthusiasts from around the world, including, of course, the extensive British Empire. Never be afraid to show your admiration when a plant in a friend’s garden catches your eye … after all, you’ll never be offered a cutting of you don’t express your interest! Declarer led a heart and finessed, playing the jack from board. Then she cashed the ace of hearts, throwing a spade from hand, and ruffed a heart, bringing down the king. Now she led a low trump over to the nine on board. The 2-2 split in trumps allowed her to cash the remaining three hearts on board, discarding all her losing spades. She then claimed the doubled slam, winning six diamonds, five hearts and the ace of spades. Who would believe that the West hand, with all those good cards, could only take the ace of trumps! Of course, if West had only led a second trump after the ace, removing the critical nine of diamonds as an entry to board before the hearts had been set up, then things would have been very different. Chiang Mai now has an official bridge club - the Bridge Club of Chiang Mai. We welcome new players. For information on the Club please contact Chris Hedges at: [email protected] If you have bridge questions, or to send me your interesting hands, please contact me at: [email protected] I look forward to meeting you at the bridge table.